Low salt, mild tasting and soft similar to Mozzarella, it melts well. It is ideal for use in all kind of desserts and greatly appreciated in preparing Middle Eastern desserts Kunafa-bil-Jibn and Halawat-el-Jibn. Ara Baghdassarian continues the path drawn by his father, Ohannes Baghdassarian. He preserves the historical Armenian heritage of the Baghdassarian family by producing authentic all natural specialty cheeses specialty artisan cheese, Armenian cheese, Mediterranean cheese, Mideastern cheese, specialty Middle Eastern dairy products and natural cheese and dairy food products. KARLACTI traditional quality Mediterranean dairy products and large variety of handcrafted authentic Middle Eastern specialty all natural artisan cheeses and low salt yogurt drink do not contain any additive. Our Mediterranean specialty food cheese and dairy products are free of thickeners, stabilizers, added proteins, gluten and starch. 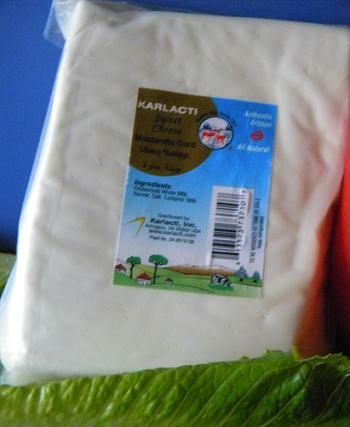 Karlacti specialty cheeses are produced according to genuine traditions and rigorous quality standards for your health.